Did you ever buy one of those foaming hand soap dispensers and then not know what to do with it when it was empty? I've done that a few times. 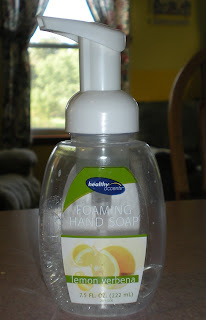 We don't buy foaming hand soap here that often because it is more expensive then the regular hand soap, but when we go on vacation, I like to give them a little treat--they love that foaming soap. 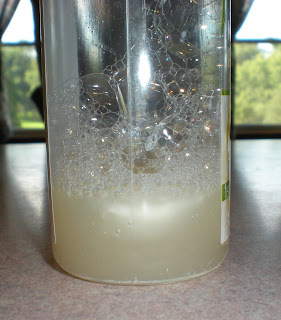 Well, the aide at our school introduced me to a way to make the foaming hand soap. Not only is it great because the children like the foamy stuff, but it is cost effective too. The most important aspect of this is that you need a dispenser with the foaming soap contraption--I hope that's not too technical:). So I bought a foaming hand soap dispenser from the store. We used it all up and it was time to refill. First take off the lid--I know it's obvious, I'm just trying to be thorough. 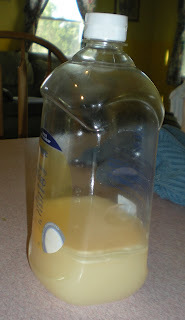 Add about 1 inch of regular liquid soap refill. If you have a larger container, you may have to add a bit more. My containers are about 8 ounces. Also, any type of liquid soap should work too. Now fill the container the rest of the way with water. 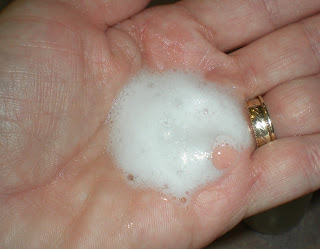 Shake well and WA LA--a full container of foaming hand soap. Any palm readers in the house? now that I know how simple it is we'll be making our own. Of course now that I know how simple it is I'm feeling a little ripped off. Thanks-my girls love foaming soap. We do this at home too! It makes me feel like I am saving more money that even with regular soap! That's a great tip! My kids love the foaming soap too! Are you kidding...it's that easy! We just got a foaming soap dispenser, so I will be trying this once that runs out! Thanks so much! And it actually STAYS foamy in the container? Amazing! We do this with the kids body wash and shampoo too... it makes a bottle last SO LONG that I can afford to get them the fancy organic stuff.